1. Combine and grind the ginger garlic paste and green chillies. 3. Heat oil in a pan. 4. Add the garam masala powder and onions. 5. Fry till onions turn translucent. 6. Add the ground paste and fry till onions turn golden brown. 7. Add the lamb and chilli powder. 8. Fry for a few minutes and add corn flour and egg. 9. Mix well and keep aside to cool. 10. Make small balls of the mixture and flatten them in your palm. 11. Heat oil in a deep frying pan over moderate flame. 12. 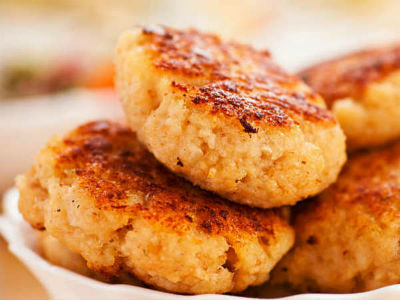 Roll the cutlets in breadcrumbs and deep fry till golden brown and crisp. Feel free to comment or share your thoughts on this Lamb Cutlet Recipe from Awesome Cuisine.